Mumbo steps out of the shadows! 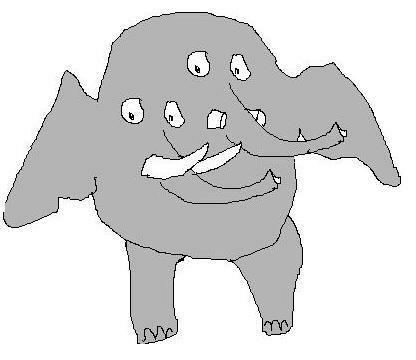 Remember Mumbo, Schrödinger’s jumbo, who has his tusks both conserved for the community and hacked off for personal gain simultaneously? Well Suzie Thomas (of the Scottish Centre for Crime and Justice Research) has mentioned him in Internet Archaeology 33, saying disagreement between detectorists and archaeologists is “symptomatic of an ongoing ‘elephant in the room’ – the fact that archaeologists and metal-detector users view the issues differently”. Note, there’s no reference to a compromise standard or exempting thousands of them from their obligations or declaring a draw on how the resource should be treated. The only situation archaeologists can or will consider acceptable involves artefact hunters, all of them, recording what they find to a standard acceptable and useful to archaeological research. Artefact hunters must do the right thing by the public to the satisfaction of archaeologists. It’s as simple as that. The significance of this revelation is that no way is that situation achievable. After 15 years of persuasion only about 30% 0f artefact hunters aspire to reach even the grossly emasculated version of responsible behaviour their representatives have negotiated and it’s arguable that not 1% works to the standard deemed acceptable and useful to archaeological research for archaeological investigations as laid out by English Heritage. Why would they? They have fundamentally different aims and consequently, as Ms Thomas says, they view the issues differently”. Worst of all, is something else she says: “The debate might continue for many more decades”. That’s worth thinking about. It means people may continue for decades to do in our country what they’d go to jail for elsewhere without British archaeologists having even persuaded them to do it in an acceptable fashion. Persuasion is clearly not the answer, statutory regulation is. But for how much longer must that not be publicly admitted? Many more decades? Cui bono? Non-recording detectorists, no-one else.